Overall, the Falcon 9 has lowered launch costs since it went into service, though. NASA said it will pay $400 million more for cargo delivery to the International Space Station (ISS) starting in 2020, thanks in part to a 50 percent price increase from supplier SpaceX. On top of that, the ISS will receive six fewer tons of cargo, so on a cost-per-pound basis, prices will rise by 14 percent for the second phase of commercial resupply (CRS-2) missions between 2020 and 2024. The information comes from a new NASA audit, and reveals new details about the 2016 bidding for CRS-2 missions. For the first ISS resupply phase, between 2012 and 2020, NASA estimates it will fly 31 missions, with SpaceX doing 20 and Orbital ATK 11. SpaceX's launch price was considerably cheaper than its rival-- $152.1 million per mission versus $262.6 million. Starting in 2020, however, NASA said SpaceX's prices will rise by 50 percent, so each flight would cost $228 million or so, by my calculations. Orbital ATK's rate will drop by 15 percent to around $223 million, so SpaceX will effectively be losing its cost advantage. 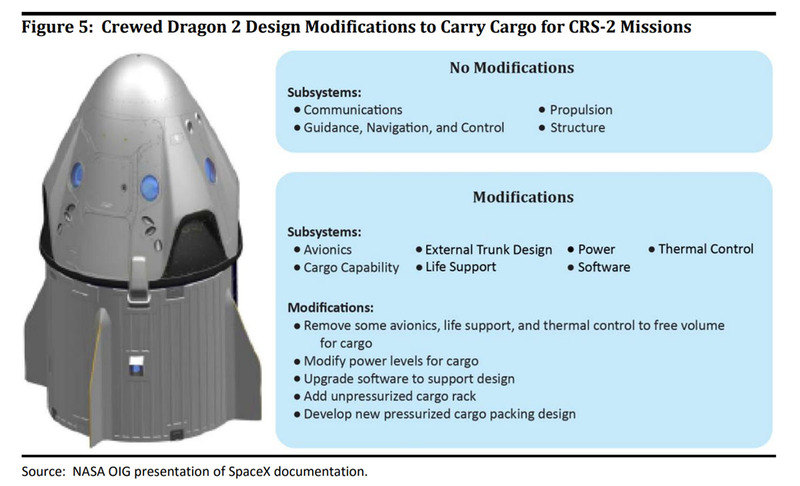 One reason for that, the report said, is that SpaceX redesigned the Dragon 2 capsule to increase cargo volume by 30 percent, run longer missions and give NASA quicker access to scientific samples returning to Earth. It also seems that SpaceX may have been undercharging for its services. "They also indicated that their CRS-2 pricing reflected a better understanding of the costs involved after several years of experience with cargo resupply missions," the report stated. SpaceX isn't the only reason ISS resupply costs are going up. NASA decided to use three contractors instead of two for CRS-2, with Sierra Nevada's Dream Chaser set to fly missions by 2020. That will give NASA greater capacity to carry pressurized cargo, in turn reducing the number of needed flights. It will also give the agency more redundancy and reduce astronaut workloads. Despite the higher costs for CRS-2, NASA had no regrets about using private companies for ISS resupply missions. "NASA officials reviewed past launch pricing and found the cost for a basic Atlas V configuration decreased by roughly $20 million per launch after the Falcon 9 became eligible in 2013 to compete for launch services contracts through the agency's Launch Services Program," the report stated.